iOS 9 has been released officially and now, you can update your iPhone/iPad/iPod touch to iOS 9 directly. But in order to update to iOS 9 successfully, please remember to do a backup work for your iDevice. Last time, I have shown you 6 tips to better experience iOS 9, and after its official release, some more hidden features are unveiled by MacRumors. In the end. we will attach a video which shows you hidden features in iOS 9. Here, I just want to list some hidden features here and you can watch more from the video. Battery settings – To go along with all the new battery features in iOS 9, there’s a new dedicated “Battery” section in the Settings app, where Low Power Mode can be turned on. It also displays more detailed battery usage information that can be sorted by apps using the most and the least amount of power. With Low Power Mode, background activity, motion effects, and animated wallpapers are disabled. Battery information is also displayed in the Notification Center, for the Apple Watch, iOS devices, and some other connected devices like wireless headphones. Find My Friends/iPhone – Find My Friends and Find My iPhone are both default apps with iOS 9 and come installed automatically. Before these needed to be downloaded from the App Store. Find My Friends can be added to the Notification Center, where it tracks the location of your friends. 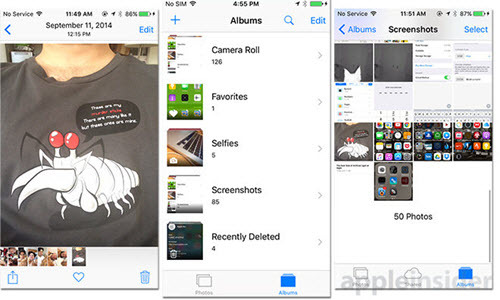 Photo app folders – iOS 9 has new folders for selfies and screenshots in the Photos app. The “Selfies” folder aggregates all photos captured with the front-facing camera, while the “Screenshots” folder houses all screenshots captured by holding down the power button and home button. This small but important change makes it a lot easier to keep track of selfie shots and screenshots. App folders on iPad – App folders on the iPad now display apps in a 4×4 arrangement instead of a 3×3 arrangement, allowing users to see more apps in a folder at a glance. With 15 pages of apps allowed per folder, folders are able to house up to 240 apps instead of 135. Keyboard changes – The shift function has been altered once again, making it easier to determine when it’s activated and when caps lock is turned on. With shift pressed, all letters on the keyboard are now shown in upper case. With shift off, letters on the keyboard are lower case. On iPad, there are also some new edit controls and a two-finger gesture that turns the keyboard into a trackpad. Home Sharing – Home Sharing for music was removed in iOS 8.4 with the launch of the new music app and the new Apple Music service, but in iOS 9, it’s back. 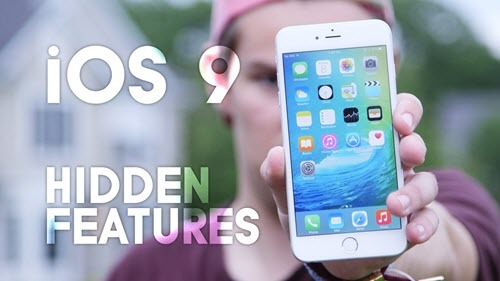 Have you found other new or hidden features for iOS 9? If you do, please share them with us here. This entry was posted in iOS 9, Tips and Tricks and tagged ios 9 hidden features, ios 9 new features, ios 9 using tips by IosdroneD. Bookmark the permalink.